Seeing identical twins is indeed cute especially if they wear the same attire. But not only clothes are identical for some twins. Even their beds look totally alike too! 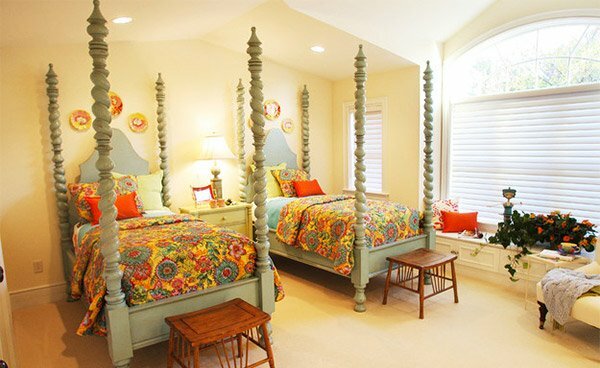 It is really cute to find bedrooms with two identical beds. We even saw a bedroom with three identical beds since they have triplets! Sounds fun right? Well, we are going to show you 20 bedrooms with identical twin beds. Upon hearing the words twin beds, you would think that all these beds are always covered with the same fabric but actually not all. Not all twin beds are decorated identically unless it is really intended for twins. 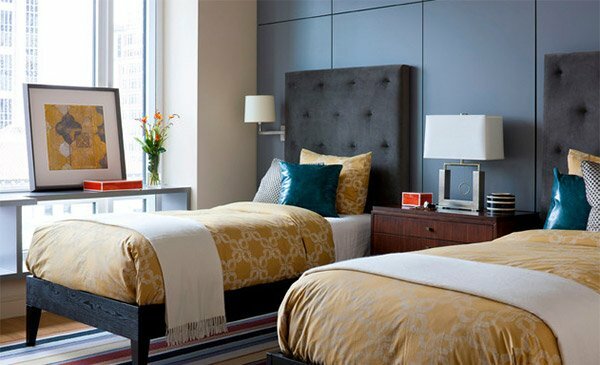 So, we will share to you some bedrooms that have identical beds in it. Scroll down and be amazed with the duplicate beauty you are about to see. 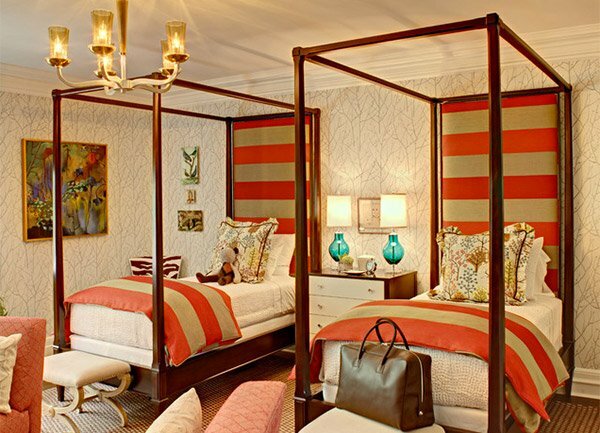 Hickory Chair twin beds with a horizontal stripe headboard and custom bedding were used for this bedroom. The room doesn’t look noisy despite the patterns on the wall and flooring. Annie Selke Links Fabric in pink were used for the cover of these beds. Other colors were a perfect match to these patterns. A floor to ceiling upholstered headboard gives this bedroom a lovely look especially with their choice of colors. The headboards of these beds were custom made by a local shop and were an attractive feature of this bedroom. A relaxed contemporary bedroom using blends of lightened driftwood finishes and darker tone furnishings. 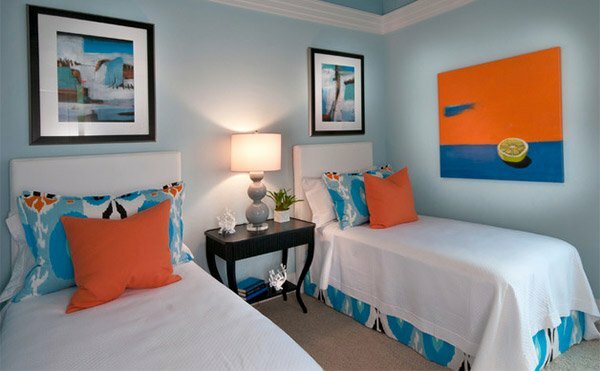 Bright colors accentuate the room with contemporary artworks. 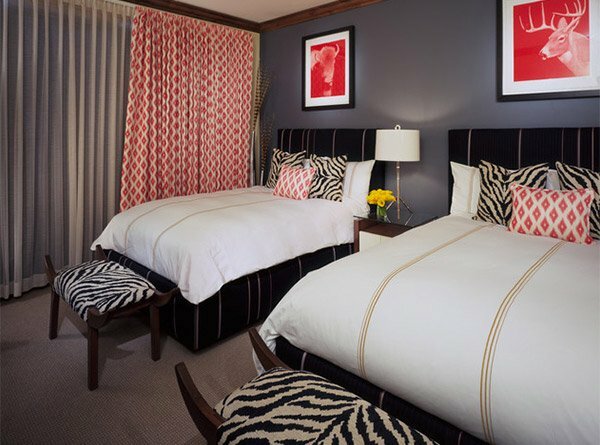 You can feel the drama of this bedroom as it combines bold colors and exotic animal prints. 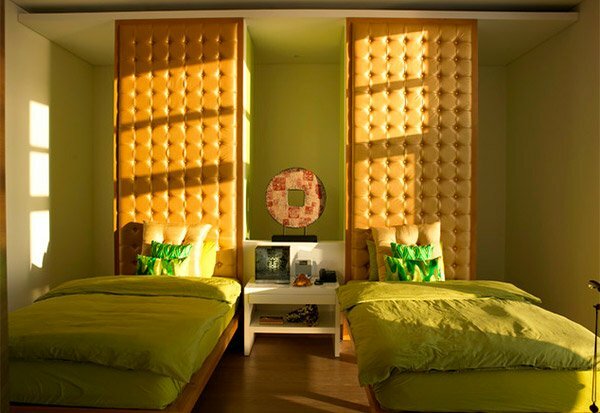 Leather tufted headboards would make the twins feel like real princesses. A traditional bedroom has traditional beds and playful bubble murals. This bedroom is suited for two lovely princesses! The wall covering is from Designers Guild and you can find the headboards at Posh Tots. This is what you can call as understated elegance because of the subtle hues of pink and green in it. The carvings of this four poster beds added beauty to the room especially with its bright colors. The beds are by Sommerset Bay. The twin headboards, bedframes, duvets and shams are all from West Elm. We love the yellow ochre and dark gray combo. Orange and blue combined looks playful and lovely. The bedding is a custom design with Designers Guild fabric. You can spot different colors in the bedroom but it remains simple yet beautiful. The dog pillow which is an attractive feature is from Serena and Lily. Beddings and curtain and so lovely! Not just the colors are dashing but the entire look of the bedroom with an armoire from Stanley Kids Furniture (Young America). This bedroom is part of a custom remodel to update a Southern Home. 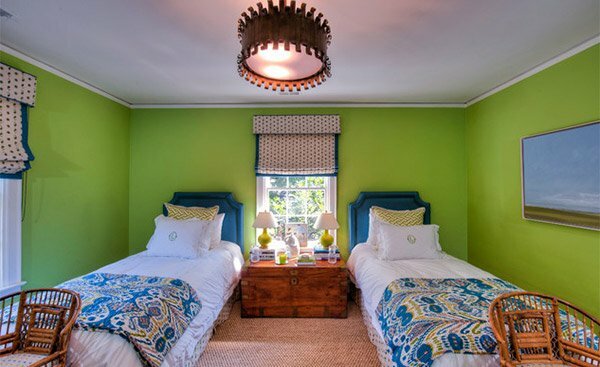 The lime wall and lime accents added life to this bedroom. Pastel colors and rich textures sums up to a girly bedroom. You can observe an arc between the beds which is a little door that leads to the playroom. The combination of patterns in this contemporary bedroom is gorgeous! Beddings from PB Teen and white wooden beds from Land of Nod- both worked well for this girly chic bedroom. 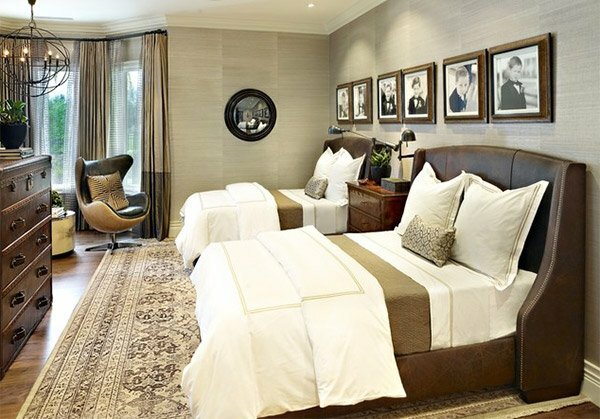 Wingback beds called the ‘Warner Bed’ from Restoration Hardware were the focal point of this traditional bedroom. 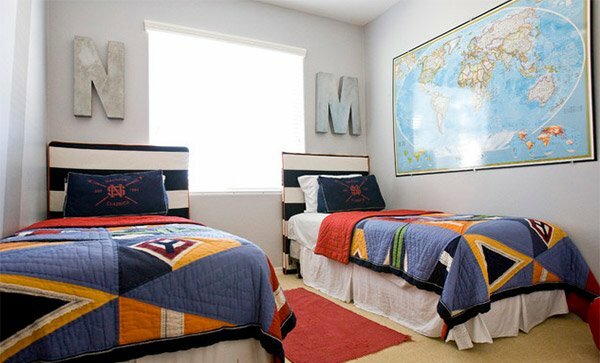 A bedroom for boys with a nautical theme. Notice the different letters on top of the headboard. Isn’t this cute? 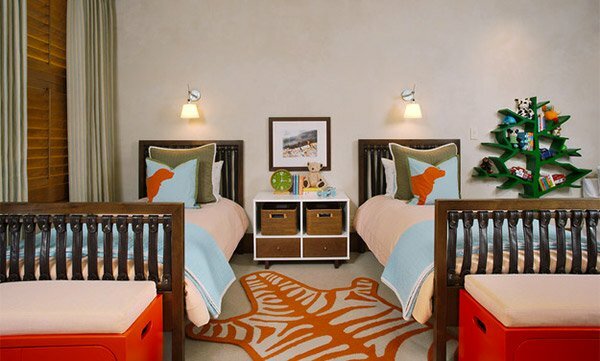 It is amazing that twins can also have beds that look totally identical! Even boys have this kind of bedrooms and we find that interesting. You can always choose the theme you want for a bedroom. 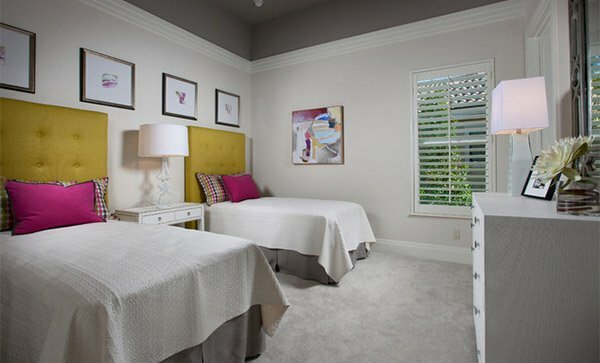 If you will be purchasing new furniture for the bedroom, you can check on our tips on how to buy bedroom sets. Your right they’re cute! !but only few of the sample are good for boys. it nice to have their own shelves beside their bed,useful idea…. Very stylus interior designs,I will share this to my friend who has a twin baby. Isabella II is the only simplest design for this twin beds. The brown color complement to the ambiance of the mansion bedroom.